Few see mosques as anything other than places of worship. But they also have an identity as architectural structures. But, as a category of architectural structure, I wager there are more mosques in Pakistan than any other type of structure. Certainly in my city, Lahore, at no time is one outside the sight or sound of these ubiquitous places of God- readers, especially urban based readers, can try this experiment for themselves. (The examples used here are all from Lahore, but the points are generic to the modern mosque in Pakistan;). For this reason, mosques are the most dominant characteristic of our built environment. Yet most of the people I mention this to don’t seem to get the point, nor do some of the architects I know. From a real estate development of construction point of view, I would think that mosques would be the first thing young architects would get themselves busy with. Demand is high, so the potential of work opportunities that build and develop a profile of related work would appear unlimited. Yet how many architects or developers specialize in the mosque business, so to speak? One of the reasons for this, I have been told, is that mosque construction and design isn’t considered attractive work. 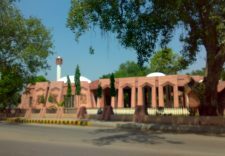 Most mosques are small affairs, and the client – and by client I mean the person or community that’s actually footing the bill for its construction – is more interested in cutting costs than, say, re-interpreting the symmetry of the Al-hambra, or the grandeur of the Badshahi mosque, or the majesty of the Masjid Wazir Khan. The majesty of the original Mughal mosque. 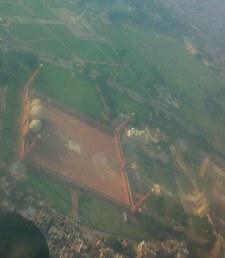 Badshahi Masjid as seen from the ground and the air. 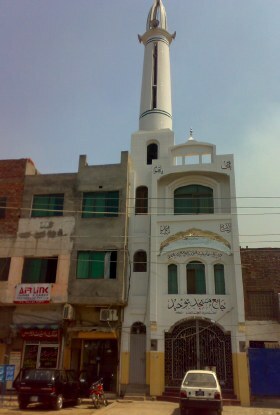 Whatever the reasons for this, mosque design and construction in Pakistan appears to be outside the architect’s realm. The architect seems more at ease designing a high-rise or farm-house. Or school. But not mosques. Because architects are largely removed from the design of mosques, the position has been taken up by the contractor or, in some cases, by the client. The most obvious type of mosque design is the Moghul Mosque. It has familiar features. A curved, almost onion shaped dome, minarets and, quite often, an open courtyard. 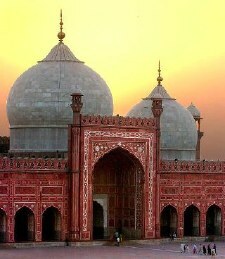 A perfect example of the Moghul Mosque is the Badshahi masjid. Or the mosque inside Aitchison College. 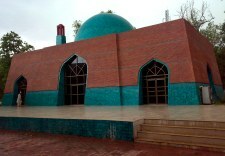 Modern versions of the Moghul mosque are rare. 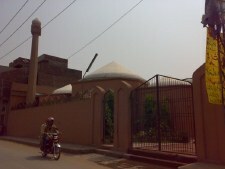 I can think of only a handful of mosques in Lahore that boast a curved dome. I have been informed one possible reason for this is that most contractors lack the complex knowledge of engineering required to construct onion shaped domes. Skill comes at cost, and onion shaped domes, I am told, are also expensive to commission. Whatever the reason, whenever I spot one, I tend to marvel at the labor of love a new Moghul Mosque must have been. MashAllah, so to speak. 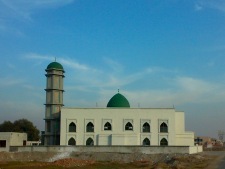 From L to R: (1) a modern onion-shaped dome on a mosque on the Ferozepur Road, (2)some of the problems that come up in the execution of an onion-shaped dome;mosque in the National Engineering Works area behind the Shalimar Gardens, (3) a Masjid-ul-Nabawi style mosque on Lahore’s Mall Road; and (4) a Minimalist Masjid ul Nabawi mosque, Phase V, DHA. 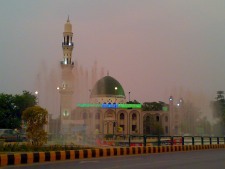 In contrast to the Moghul Mosque is what I call the Masjid ul Nabwi mosque. Like the Prophet Muhammad’s (PBUH) mosque in Medina, these mosques boast a signature green dome and single minaret. The most prominent example I can think of a Masjid ul Nabwi mosque is the Masjid e Khizria at the intersection of Lahore’s Mall and Canal intersection. 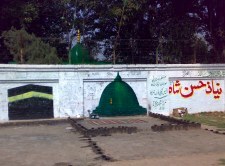 This mosque, a well known encroachment, was, according to a 1927 Survey Map of India that I have, once the shrine of Hazrat Baba Hazarwala. But that survey map also tells me there was a protected forest near Kot Lakhpat. The forces that continue to morph and change our cities are too powerful to be moved by sentimentality or nostalgia. The reason the Masjid ul Nabawi style mosque have the type of dome design they do is because of the dome design of the Masjid ul Nabawi in Medina. At the time that dome design was finalized in the 12th century â€“ and by all accounts it was as technically advanced in design as anything else seen in the region â€“ Arab masons had not yet mastered the science of the curved dome. That achievement was claimed by the Great Moghul, who perfected it in the execution of such memorable structures as the Taj Mahal or the Jama Masjid. The Dome + 1 Minaret formula is a popular one. Perhaps because of increasing influence of Arab traditions in Pakistan. Perhaps because of the aesthetic. In the contractor-run world of mosque building, this theme is paramount, cuts across the major differences I am pointing out and has been played out in many a subtle permutation. 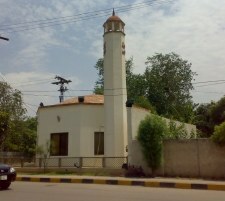 I have also noticed that, in the Cantonment and DHA areas, mosque design is much different. Obviously, the money to construct these houses of worship comes from the deep pockets of our armed forces, may Allah bless them. If, therefore, there is exception to my general rule that the mosque architecture business isn’t a lucrative one, this is it. If mosque design has changed at all in Pakistan, it has done so most notably in these areas. As a result, in these military areas we find examples of what I call the Military Mosque. Four examples of the Military Mosque. L to R: (1) Opposite Fortress Stadium, on Shami Road, (2) Mosque inside Cantonment Board Office, (3) Sarwar Road Mosque, and (4) Mosque in Phase V, DHA, modeled on the Hagia Sophia in Istanbul. I suspect it is the relative secularism of the armed forces that have freed them from dutiful observance of Mogul or Arab design. Also, when architects are given the liberty of designing a mosque, the idea of incorporating old ideas into new must be attractive. 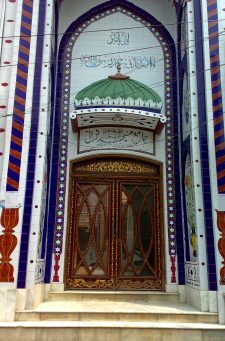 Sometimes, as a result, we get modern mosques shorn of some of the ornamentation found on mosques outside the Cantonment. 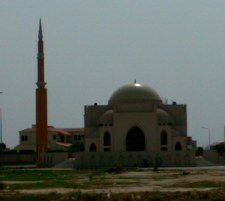 If anything, the Military Mosque is a simplification of the dome and minaret elements of the mosque. 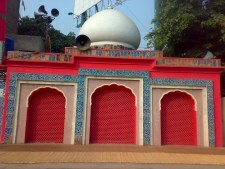 Examples of the mosques opposite Fortress Stadium, the mosque inside the Cantonment Board Office and on the intersection of Abid Majid and Sarwar Road. Nonetheless, some modern mosque architecture in areas run by the military is downright, well, military. In Phase V, Defence, several mosques have been constructed that look like a cross between the Hagia Sophia in Istanbul and a .202 cartridge. 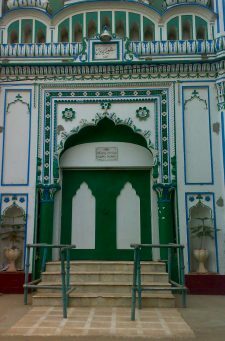 The first two pictures are of the entrances of the Rajgarh Road Mosque near Chauburji, and of a mosque in Krishanagar. The third picture is a 2-D place of worship in the Moghulpura Railway Workshops area (notice the real dome on the other side of the wall). The final picture is of faÃ§ade ornamentation at the mosque on Rajgarh Road. Other than the Moghul Mosque, the Masjid ul Nabawi mosque and the Military Mosque, the last category of mosque design I have been able to discern in Lahore’s built environment is what I used to call the two-dimensional, or 2-D, mosque. 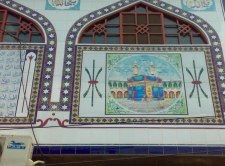 A perfect example of such a place of worship is on along one of the walls in the Moghulpura Railways Workshop area. Here, the dome and minaret elements of a mosque are depicted on nothing more than a boundary wall – in two dimensions. At first, I believed the 2-D Mosque was a product of necessity. Of un-scalable walls or illogical building regulations. It was only later I realized that a better categorization of such sacrifice of form to function would be The Poor Man’s Mosque. The Poor Man’s Mosque can be located anywhere and offer the devout ample opportunity to fulfill their obligations to the Almighty. Most notably and because, no doubt, of budget constraints, these constructions pay only formal notice to the dome and minaret. Often, because of its expense and complexity, the dome is sacrificed entirely. In its place is a faÃ§ade with several miniature minarets – what my friend amusingly coined Mini-rets. Yet whatever the intent behind their design outside or dogma inside, mosque architecture in Pakistan, though not in the hands of trained architects, is fast developing a vocabulary of its own. It is a shame the liberal elite is so dismissive of the Islamic culture that connects every Pakistani to another. Perhaps an appreciation of the unskilled and semi-skilled labor that went in to designing these magnificent structures would be the first of many steps in the right direction. Note: Ahmad Rafay Alam is an advocate of the high court and a member of the adjunct faculty at LUMS. He has an interest in urban planning. An edited version of this article was published in The Friday Times, and this longer version at the blog Lahorenama. Well thought out article Rafay, Most of the mosques are constructed over a period of years and are therefore a mix of various traits. I guess the Millitary type mosque is more turkish or Post oil boom Arab in nature. It is either somewhat secular or an expressionless blunt facade. Call it nostalgia, the Rajgarh type mosque beats all models. Yet all these mosques have their distinct architectural character but the big mighty walls and barriers installed outside are an eyesore, perhaps the architects of tomorrow shall rank security a foremost feature while designing any mosque. Very nice article. I wish we had more discussion on architecture and what we are doing to our built environment as a whole. Enjoyed reading this and loved the categories you invent to describe what is happening. I think many people remain confused between ‘architecture’ and ‘civil engineering’. The two are very different and you capture the aesthetic aspects of architecture very well. It is a pity that the new mosques being built are becoming utilitarian and losing the aesthetic elements and flair that were once the mark of our masjids. They are indeed major cultural heritage and should be thought of architecturally as you do brilliantly here. On the other hand, I think many of the uglier structures will disappear with time and the ones that will reman are the better ones. I am sure that is what has been happening historically. It is not a if Mughal Lahore had ONLY the Badshahi masjid, but that is the one that stood the test of time. The question is, which ones of our new mosques will stand the test of time? Architecturally there is no such thing as ‘Mughal Mosque’ or ‘Military Mosque’ nor the dome at Nabvi Mosque in Madina could be characterised as ‘Arab Dome’. Similarly the copula at Hagia Sophia in Istanbul is based on series of very complicated system of domes and half domes. My comments are more in the defence of the art and science of architecture and have less to do with the person of the author of this article. If Mr. Alam wants to criticize Pak Armed Forces, he should do so but not at the expense of Islamic Architecture. That art and science of mosque building could be divided into categories such as Moghul Mosque, Masjid ul Nabwi Mosque, Military Mosque, and 2-D Mosque is simply ridiculous. The subject demands serious attention and not a silly satire. Readers of ATP expect better. ATP Photo-Quiz: Where in Pakistan is this?